In my house, my sons and I eat meat once a week, on Shabbat. (My husband is vegetarian.) Whether our infrequent meat meals somehow relate to the subtle influence of my husband, or the produce-centric Israeli style of eating, or my background as a pastry chef that precludes me from feeling totally comfortable handling raw meat, who knows? Dough, however, is a completely different story. While others seem to effortlessly reduce their starchy carbohydrate intake—and consequently shed their love handles—we spend our weeknights enjoying saucy shakshuka with freshly-baked pitas; homemade pizzas and pastas with zingy sauces; dense, chewy bagels; and legume-based soups with a nice warm bread close to hand. In cold winter months, beef and barley soups and stews have become beloved by generations of Ashkenazi Jews. Found in many variations—some with beans, some with mushrooms, some with veggies and even tomatoes but always with barley—I like to whip up this almost vegetarian variation for my husband, who makes an exception for chicken stock (for whatever reason, you’ll have to ask him!). Remember the Manischewitz soup packets with the little, quick-cooking beans and dried spices? 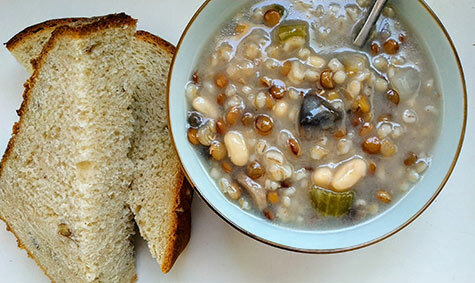 My mother used to make incredibly delicious pots of soup using those packets as her base, and that was the flavor profile I aimed for when creating a homemade version of mushroom and barley soup. Mine is as thick as a stew (especially the next day) and “meaty” without including meat. The best part about serving it alongside my crusty outside, pillowy inside, Pecan Sandwich Bread is that the next day you can toast a slice for breakfast, smearing it with melting butter and strawberry jam. It’s a little treat for the carb lovers who just want to live a little. The brown lentils thicken the soup’s texture to perfect sopping-up consistency while adding extra oomph and character. 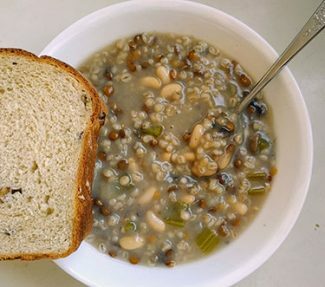 A comforting winter staple in Askenazi Jewish households, this version of beef and barley soup omits the meat in favor of hearty white beans, brown lentils, roughly chopped mushrooms and pearl barley, which come together with chicken stock (or beef stock) to create a warming, porridge-like stew. Place dried white beans in a medium bowl. Cover by at least 2 inches with cold water and let sit overnight. The next day, when you are ready to make the soup, drain and rinse the beans in a fine mesh strainer. Look over the barley and lentil for stones, and rinse alongside the beans. Set aside. In a large soup pot, heat olive oil over medium-high heat. Add the roughly chopped onion, celery and mushrooms, then using a microplane or garlic press grate or crush the garlic cloves over the soup pot. Cook for 2 to 3 minutes, stirring occasionally, until the onion is translucent and the mushrooms have lightly browned. Add the rinsed beans, barley and lentils, and stir to combine. Pour in the chicken stock. (Can substitute beef stock, vegetable stock or water, but if using water make sure to add salt and pepper to taste once the beans are cooked). Bring to a boil. Once at a boil, reduce heat to a simmer and let cook until the beans are tender and the soup has thickened, about 1 1/2 hours. Season with salt and pepper to taste. Soft on the inside, crusty on the outside, this bread gets a sweet, nutty crunch from chopped pecan halves. 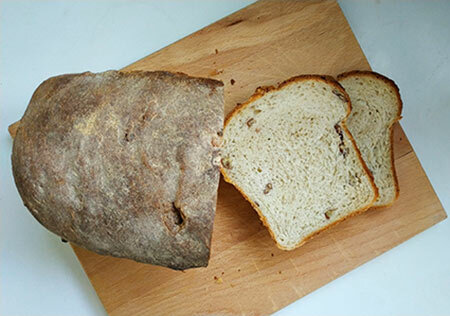 The thick crust helps preserve the bread, which stays fresh for up to three days. Leftovers are perfect for sandwiches or as breakfast toast. Measure flour into a large bowl, and add all other dry ingredients, mixing after each addition. Add water a little at a time and mix by hand until a dough is formed. Flip dough out onto a lightly floured surface and knead until smooth and elastic, about 5 to 10 minutes. Add the pecans, and knead to incorporate. Form the dough into a ball and place back in your original bowl. Cover with plastic wrap and let rise until the dough reaches the top of the bowl. (This could take several hours). Grease well, or line 1 large loaf pan with parchment paper, and set aside. When dough has almost risen entirely, preheat oven to 500°. Bake for 35 to 40 minutes, until deeply golden brown. To check for doneness, rap the bottom of the load with your fingers. It should sound hollow in the center. Remove from oven, and let cool completely before eating. * This process can be sped up by letting the shaped loaf rise in an oven with only it’s light on.